Grease bottom and sides of 8-inch square (2-quart) glass baking dish with butter. In 3-quart heavy saucepan, heat all ingredients to boiling over medium heat, stirring constantly. Boil uncovered about 35 minutes, stirring frequently, until candy thermometer reads 245°F or until small amount of mixture dropped into cup of very cold water forms a firm ball that holds its shape until pressed. Immediately spread caramel mixture in baking dish. Cool completely, about 2 hours. Cut into 8 rows by 8 rows to make 1-inch squares. Wrap candies individually in waxed paper or plastic wrap. Store in tightly covered container. To make Chocolate Caramels, heat 2 oz unsweetened baking chocolate with the sugar mixture. Cut little rectangles of waxed paper ahead of time, so when you're ready to wrap, you’re ready to go! 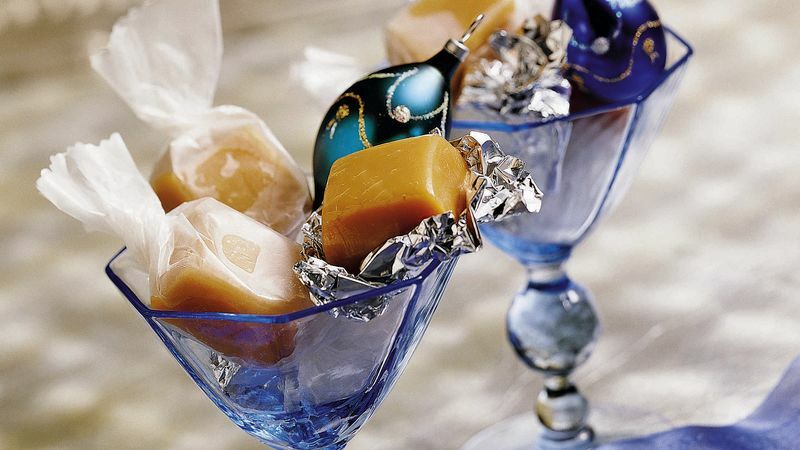 Cutting the caramels with a kitchen scissors is quicker and easier than using a knife.